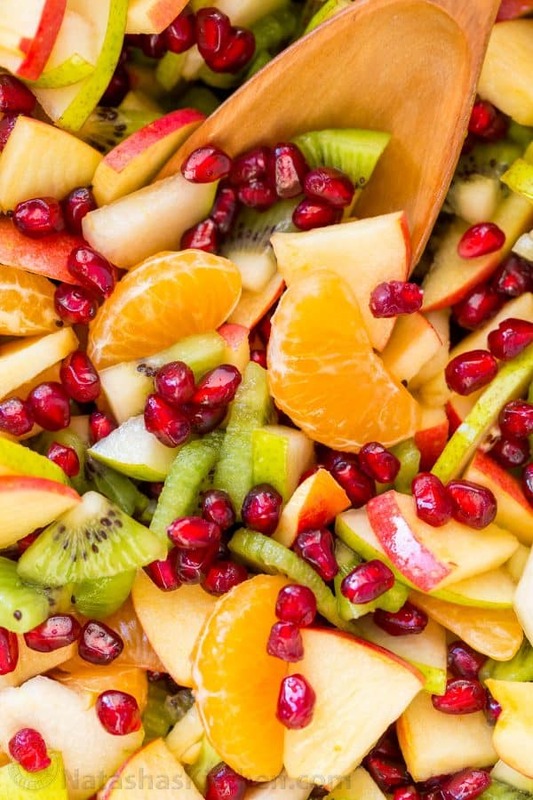 This winter fruit salad is wonderfully refreshing and loaded with all the best fruits of Autumn and Winter. 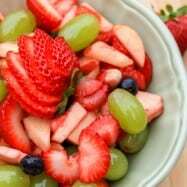 It is perfect for parties because the citrus prevents browning (crisp and pretty even after 4-6 hours in the refrigerator). 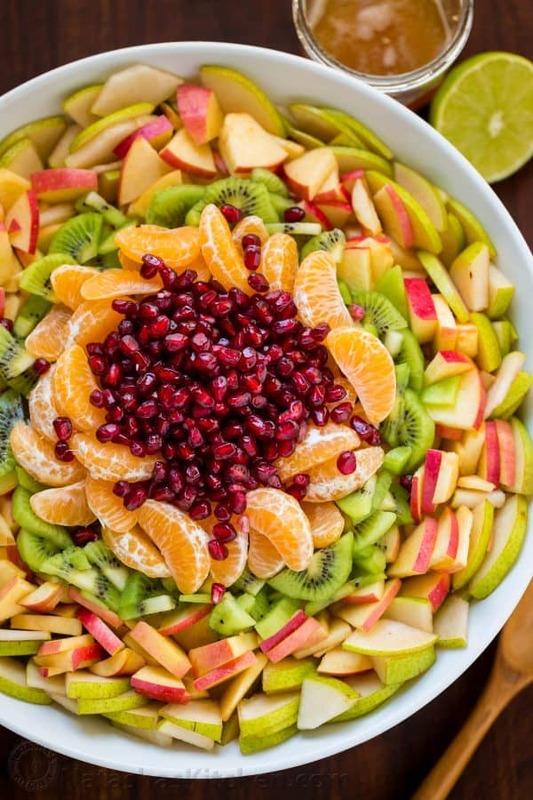 You’ll definitely get a healthy dose of fruit with this salad and you’ll be running for a refill! 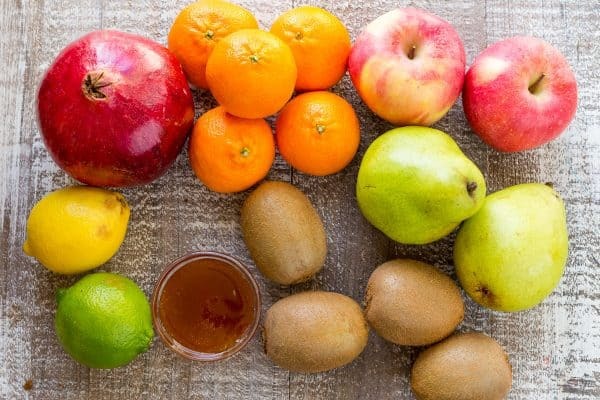 The combination of lemon, lime and honey makes the most amazing salad dressing and it draws out the naturally sweet and tangy flavors in each bite. 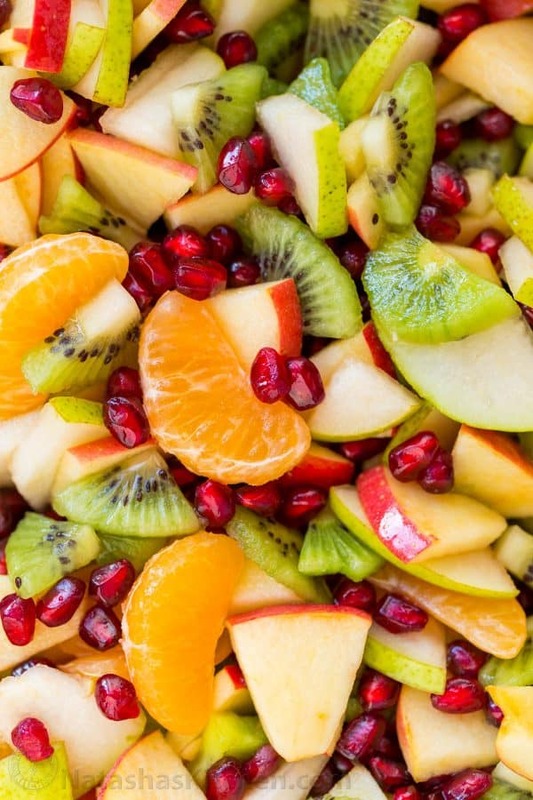 You will want this syrup on all of your fruit salads! 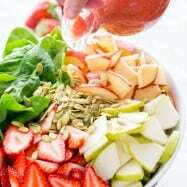 On Substitutions: You can add banana if you like – it is an inexpensive way to bulk up the salad for a larger crowd. The color and flavor of mango would be a nice add-in here as well. 1. 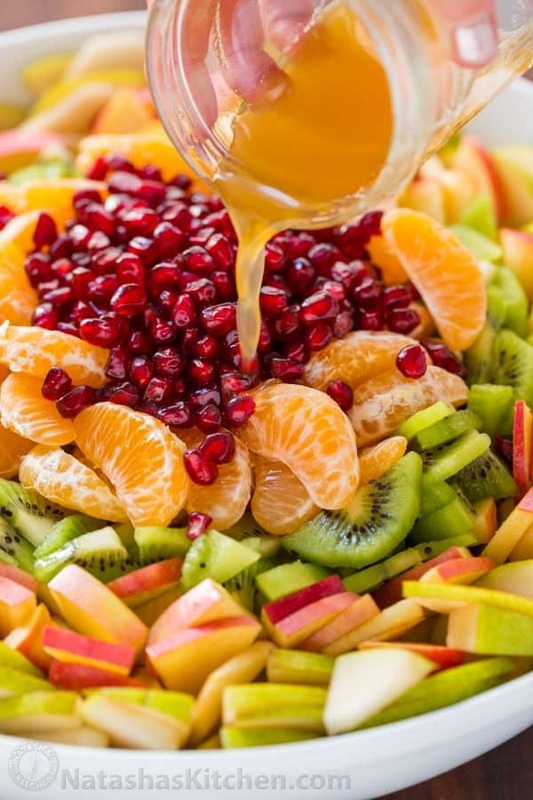 In a large mixing bowl combine all of the prepared fruit – 5 segmented clementines, 2 sliced pears, 2 sliced apples, pomegranate seeds, and 4 sliced kiwis. 2. In a measuring cup, stir together 3 Tbsp honey, 2 Tbsp lemon juice and 2 Tbsp lime juice, until honey is dissolved. 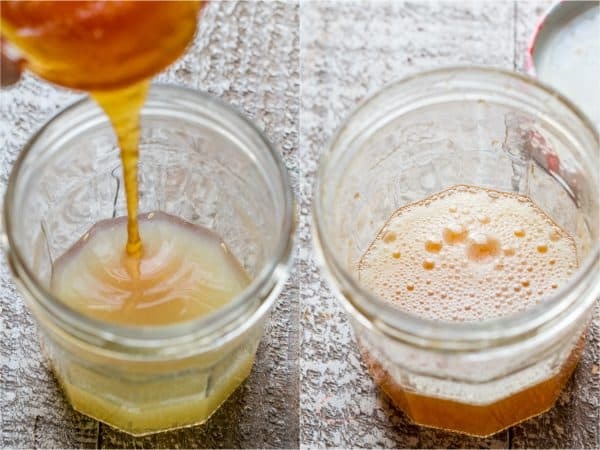 If your citrus was cold and honey is not dissolving, warm it for 10 seconds in the microwave to dissolve easier. 3. Drizzle dressing over salad and toss gently to combine. Serve right away or cover with plastic wrap and refrigerate up to 6 hours. My husband and I wolfed this down one evening after dinner. It was so satisfying and satisfied the craving for something sweet after dinner with zero guilt. Enjoy this my friends! 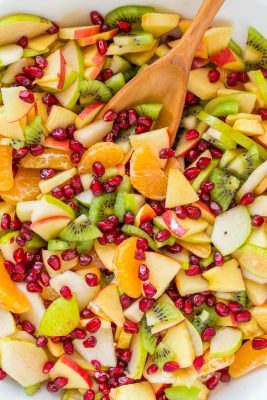 This winter fruit salad is wonderfully refreshing and loaded with all the best fruits of Autumn and Winter. 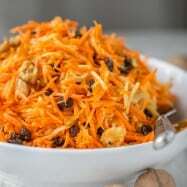 It is perfect for parties because it stays crisp and pretty even after 4-6 hours in the refrigerator. The "dressing" is sweetened with honey so there is no processed sugar here. In a large mixing bowl combine all prepared fruit - 5 segmented clementines, 2 sliced pears, 2 sliced apples, pomegranate seeds, and 4 sliced kiwis. In a measuring cup, combine: 3 Tbsp honey, 2 Tbsp lemon juice and 2 Tbsp lime juice, until honey is dissolved. If honey is not dissolving easily, warm for 10 seconds in microwave. 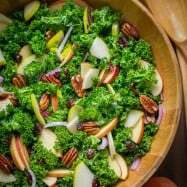 Drizzle dressing over salad and toss gently to combine. Serve right away or cover and refrigerate if not serving right away. 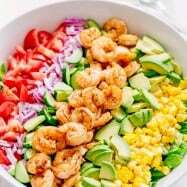 On Substitutions: Adding banana is an inexpensive way to bulk up the salad for a larger crowd. 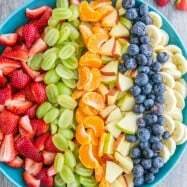 The color and flavor of mango would be a nice add-in here as well. I hope your New Year’s resolutions are off to a great start! Q: Do you have any health or diet goals for the New Year? Let me know in a comment below! I’m over here getting excited about bone broth like a big nerd (more on that soon!). Please explain what you mean by 5 count Clementine oranges.